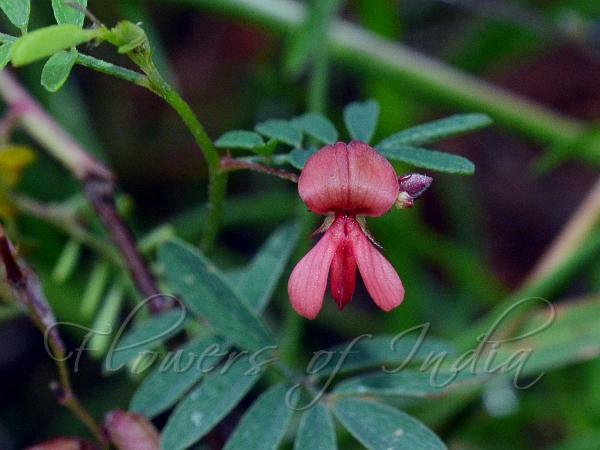 Karnataka Indigo is a diffuse herb, about 15-20 cm tall, branches hairless to nearly so. Leaves are imparipinnately compound, about 2-2.6 cm long, leaf-stalk short; leaflets 7-9, lateral leaflets opposite, about 6-10 mm long, about 3-4 mm broad, inverted-lanceshaped or linear-obovate, apiculate, velvet-hairy on both sides; leaflet-stalk about 1-1.5 mm; stipules very minute. Flowers are borne in a 3-6-flowered raceme, usually longer than the leaves. Flower-stalks are short. Calyx is 2-2.5 mm long, velvet-hairy, teeth nearly equal to the cup. Flowers are bright red. Vexillum about 3-4 mm long. Pod is about 2-2.6 cm long, linear, straight, swollen and constricted at intervals, 10-12 seeded; dotted. 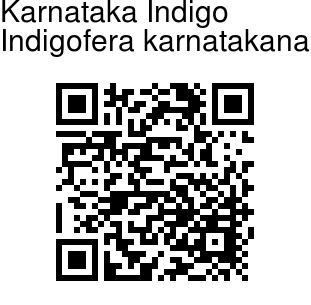 Karnataka Indigo is found in South India. Identification credit: Anurag Sharma, D.S. Rawat Photographed in Turahalli, Bangalore, Karnataka.